Although 116,827 MG 1100 sedans were produced in all, very few managed to find their way to American buyers - after all BMC did have the identical Austin America for that reason. Designed by Alec Issigonis of Mini fame, these cars were essentially a larger version of the Austin Seven/Mini but instead of utilizing rubber bushings for springs, a fancy front to rear linked "Hyrdolastic" suspension was employed, eliminating all springs and shocks. 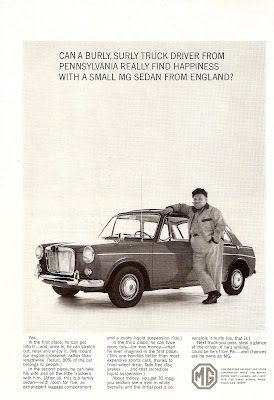 These cars were sold in the US from '63-'69 until BMC decided to let the Austin division worry about the US sedan sales until they finally gave it up in 1975. Just like the Magnette, these MG sedans were good cars that were met with great fanfare in the motherland but just like baked beans dripping over Marmite covered toast, they just never sold well here.